Ruff, Norman J.. "Provincial Government". The Canadian Encyclopedia, 13 December 2017, Historica Canada. https://www.thecanadianencyclopedia.ca/en/article/provincial-government. Accessed 19 April 2019. Under Canada's federal system, the powers of government are shared between the federal government and 10 provincial governments. Under Canada's federal system, the powers of government are shared between the federal government and 10 provincial governments. The provinces are responsible for public schooling, health and social services, highways, the administration of justice, and local government. However, overlapping and conflicting interests have stretched provincial concerns across virtually every area of Canadian life. Provinces are free to determine their own levels of public services, and each province has been true to its economic and cultural interests in its own fashion. Canada's original constitutional arrangements were far from those of a perfect or ideal federal state. The Fathers of Confederation envisaged a federal union tilted toward a strong central government. The powers of the federal government to disallow provincial statutes within one year of their passage; to appoint provincial lieutenant-governors; to declare provincial works to be for the general advantage of Canada or two or more provinces; to appoint judges of superior, district and county courts (see Judiciary); and to enjoy broad lawmaking powers all confirm the intended junior status of provincial governments. However, the evolution of Canadian society — despite the centralizing swings occasioned by the two world wars and the Great Depression of the 1930s — has long eroded this early sense of provincial subordination. Although not all contemporary provincial governments have been as assertive as those of Québec or Alberta, most claim a more equal partnership today with Ottawa. The terms of Confederation gave the central government the primary role in promoting an economic union and in stimulating national economic expansion through the development of transportation links (railways, harbours and canals) and other forms of public-policy support (see Railway History). By the 1880s the momentum behind nation building had slowed and was soon overtaken by the rise of provincially-based political and economic needs and desires. Other elements also helped enhance the status of provincial governments: The strong political leadership of provincial spokesmen such as Ontario's Oliver Mowat, Québec's Honoré Mercier and Nova Scotia's William Fielding; Prime Minister Sir Wilfrid Laurier's more sympathetic attitude towards the provinces; the development, in various provinces, of resource-based economic interests (see Resource Rights); and the emergence of a provincial bent in the decisions of Britain's Judicial Committee of the Privy Council on the distribution of federal-provincial powers. The provincial governments always played some role in their regional economic development through public investment in transportation and the growth of their public education systems. The expansion of these activities and the later growth of social assistance, health and hospital programs in the 1960s and 1970s changed the original conception and broadened the scope of provincial government. Constitution Act, 1867 (section 92), the powers of the provincial legislatures were carefully limited. The legislatures were granted specific jurisdiction in 16 subject areas. Meanwhile in section 91, powers were granted to the federal Parliament in 29 areas. The federal powers were intended for "greater certainty" in the application of Parliament's more general (and controversial) residual power to make laws for the Peace, Order and Good Government of Canada in relation to all matters not assigned exclusively to the provinces. The scope of provincial legislative power was broadly defined in the Constitution as "generally all matters of a merely local or private Nature in the Province." Other more specific areas include property and civil rights, the management and sale of provincially owned public lands, hospitals, municipal institutions, local works and undertakings, the incorporation of companies with provincial objectives, the solemnization of marriage and the administration of justice. Provincially established courts enforce both civil and criminal law. Under section 93, education is an exclusive provincial responsibility, subject to certain qualifications. Under section 95, agriculture and immigration are matters of concurrent jurisdiction but with federal paramountcy — for example, if there is conflicting legislation, the federal government prevails. The control of public lands and provincial ownership of natural resources has proved to be of particular importance. However, the most important interpretations of the Constitution regarding provincial rights have been in the area of property and civil rights. These judicial interpretations have protected provincial jurisdiction against federal encroachment and have provided specific support for provincial regulation of labour relations, marketing and business contracts. Provincial taxing powers are limited to direct taxation within the province — for example, personal and corporate income taxes, consumer taxes and certain property taxes. From their jurisdiction over the management, sale and leasing of public lands, timber and natural resources, the provinces also derive authority for the principal source of non-tax revenues. According to a 1982 constitutional amendment (92A), the provinces were granted an unrestricted taxing power ("any mode or system") in the natural-resource field. This amendment — which clarified and expanded provincial powers over non-renewable resources, forestry resources and electrical energy — was designed to resolve the constitutional difficulties posed by revenue raising in the indirect tax field. The federal government still retains the power to disallow a provincial statute, but has not done so since 1943. Any federal Cabinet that contemplated using disallowance today would encounter significant political difficulties. A lieutenant-governor's power to reserve a bill passed by the provincial legislature (in other words, to defer its assent to the governor general) can similarly be regarded as a relic of an earlier age of intergovernmental relations. The last reservation, which occurred in Saskatchewan in 1961, went against an 80-year-old understanding that this power would only be exercised on instructions from the governor general, and the bill was subsequently approved. There have been only six constitutional amendments directly affecting the powers of all provincial legislatures. The amendments of 1940, 1951 and 1964 transferred powers to Parliament with the agreement of the provinces; those of 1930, 1931 and 1982 expanded provincial powers. The 1940 amendment of section 91 (subsection 2A) secured exclusive federal government jurisdiction for a national employment insurance scheme. The numerous efforts at constitutional reform since the 1960s (see Constitutional History) have resulted in only one direct change in provincial jurisdiction: the 1982 section 92A natural resource taxation addition. Levels of government spending only partly reflect the range of provincial government activity, but they do underscore the role the provinces play in providing public goods and services, and in transferring payments to individuals. Total expenditures for all governments rose from 16 per cent of the gross domestic product (GDP) in 1926 to 50 per cent in 2001, and then began falling, reaching 35 per cent in 2011. Almost none of the recent decline has occurred in the provinces, where government spending (excluding intergovernmental transfers) rose from three per cent in 1926 to 19 per cent in 2011. Government spending, including federal income security payments and regional assistance programs, are of special significance to the economies of less prosperous provinces. Most provincial spending goes to hospital and medical care, education, income maintenance and other social services. The participation of all provincial governments in federal-provincial, shared-cost arrangements for hospital insurance and medicare (see Health Policy) helped ensure nationwide standards of service, despite some differences in their ways of financing and program coverage. In contrast, the high degree of provincial autonomy in elementary and secondary education, and the accommodation of religious and linguistic minorities, has resulted in variation in school systems. Personal income taxes, general sales taxes and natural-resource revenues are the largest sources of provincial government revenue. The relative importance of each source varies by province because of the wide variations in provinces' economic bases and differing taxation policies. Ontario and the four Atlantic provinces have harmonized their value added sales taxes (Harmonized Sales Tax, HST) with the federal goods and services tax (General Sales Tax, GST) while Alberta continues to be the only province not to levy a provincial retail sales tax. Starting in 1962, the levying of income tax by both the federal and provincial governments has been governed by a series of five-year fiscal and tax-collection arrangements. The federal government collects personal income taxes for nine provinces (excluding Québec) and corporation income taxes for eight provinces (excluding Alberta, and Québec). The growth of provincial activities was not only driven by their own initiatives, such as the introduction of public hospital insurance and medicare by Saskatchewan, and fuller exploitation of their taxation powers, but also by encouragement from the federal government. 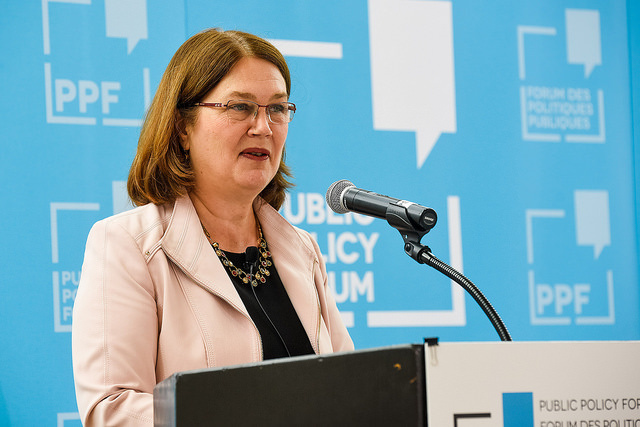 Federal shared cost programs in areas of provincial jurisdiction, and unconditional grants in the form of equalization payments, all contributed to the expansion and maintenance of provincial public services. Since 1977, however, the terms of federal financing arrangements promoted greater degrees of provincial autonomy and, with federal budgetary restraints, imposed ever increasing limits on federal support for social assistance, hospitals, medicare and post-secondary education. Unlike the expansionist, province-building era of the 1960s and 1970s, recent decades have seen major restructurings and retrenchment in the delivery of provincial education, health and other social programs, driven in part by the three post-1985 economic downturns, along with the influence of neo-conservative and smaller government approaches to public management. The policy goals of budget- balancing sustainability, economic development and trade promotion have come to dominate all provincial government policy agendas. Regulatory activity and programs for economic development conducted by a variety of provincial government agencies and Crown Corporations play an important role in provincial life. Workers' compensation, labour relations, agricultural marketing, liquor sales, energy and public utilities are all, for example, regulated by provincial agencies. Provinces have publicly owned development corporations or other agencies which provide assistance, loans and other incentives for the expansion and diversification of their economies, and often compete with each other, with varying degrees of success. Other provincial crown corporations, particularly those responsible for the generation of electrical power, are also important in provincial economics. The contraction of provincial government services and activities since the late 1990s has, however, led to a re-examination of the role of some provincial crown corporations and agencies and to their privatization. Distinctive economic and social development in the provinces has produced a variety of political cultures and party systems. However, all provincial government institutions and the conventions that shape their operation remain closely modelled after the British Westminster parliamentary tradition. Their practice of Cabinet government reflects the principles of Responsible Government. The Crown is represented through the office of the lieutenant-governor. Public policymaking and administration is controlled by an executive council or Cabinet, comprising ministers of the Crown and headed by a premier. A provincial legislature is defined, for lawmaking purposes, as being composed of the lieutenant-governor and the provincial Legislative Assembly in the same way that the central Parliament is composed of the Crown, Senate and House of Commons. 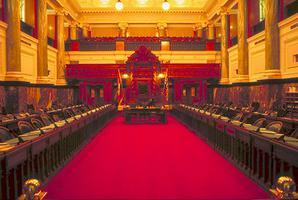 In ordinary usage, however, the term legislature refers only to the Assembly. Appointments to Cabinet are ordinarily made from members of the political party that holds the majority of seats in the Legislative Assembly. The further requirement that the premier and Cabinet maintain the support of the majority in the legislature is a principle of responsible government that had been formally acknowledged in 1848 by the then colonies of the four original provinces. Provincial government is carried out in the name of the Crown; the lieutenant-governor of the province acts as the Crown's representative in all areas of provincial jurisdiction and in the exercise of any related prerogative powers. 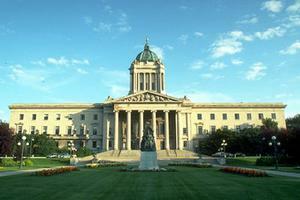 The lieutenant-governors appoint and may dismiss the provincial premiers and the members of their Cabinets. They summon, prorogue and dissolve the provincial legislatures and assent to provincial legislation in the name of the Crown. The lieutenant-governors still retain a power to withhold or reserve a bill for consideration of the central government. The latter power is presumed dormant, if not entirely inoperative. In practice the lieutenant-governor's constitutional responsibilities are limited by the conventions of responsible government and conducted on the advice of the premier. The discretionary powers enabling a lieutenant-governor to act alone in the appointment or dismissal of a premier or the dissolution of the Legislative Assembly remain potentially important, should there be any uncertainty about who commands the support of the majority in the Assembly. If a premier or Cabinet acted in a way that was unquestionably contrary to constitutional conventions, the office of lieutenant-governor might also be used to protect those fundamental principles. The lieutenant-governors are appointed by the federal Cabinet on the advice of the prime minister, with little participation from the provincial governments in the selection process. Their salaries are fixed and are paid by Parliament, and before 1892 they were regarded as federal officers. The British Judicial Committee of the Privy Council (at one time Canada's highest court of appeal) ended any suggestion of subordinate status for lieutenant-governors — and by extension for the provincial legislatures — when it held the appointment to be an act of the Crown. The Judicial Committee said the office of lieutenant-governor was as much the representative of the Crown for all the purposes of provincial government, as the office of governor general was for Canada. Provincial premiers ordinarily hold the position of President of the Executive Council and enjoy the same pre-eminent status as head of their provincial governments as prime ministers hold in relation to their federal Cabinet colleagues. Virtually all provincial cabinets have ministerial assignments for such policy areas as health, education, advanced education, jobs and skills training, labour, social services, energy, environment, natural resources (forests, lands or mines), economic development, agriculture, highways and transportation, tourism and recreation, justice, intergovernmental relations, finance, municipal affairs, and housing. Others ­— such as the Québec ministers for international relations and the Francophonie and immigration, and the British Columbia ministers for natural gas development and aboriginal relations — express the policy commitments of a particular province. The Atlantic Provinces and Québec have specific fisheries portfolios. In 2014, the average size of the provincial Cabinets was 18 members, the largest being Ontario and Québec with 27, the smallest PEI with 11. The provincial Legislative Assemblies (known as the House of Assembly in Nova Scotia, and Newfoundland and Labrador, and the National Assembly in Québec) are important expressions of Canadian democracy. As in other parliaments, the making of provincial law requires that the government's legislative proposals (bills) move through the formal state of first reading, second reading and detailed review in committee stage, and a final third reading before receiving assent by the lieutenant-governor. The budgetary process also requires that the legislature annually approve the funds required for government programs and that expenditures are to be only for those purposes authorized by the Legislative Assembly. In practice there is rarely room for independent action by the legislature in the lawmaking process. The party loyalty of individual members of the Assembly, the power of the party leadership to maintain discipline, and the government's control of the timetable of the Assembly ensure that the work of the Legislative Assembly is dominated by the premier and Cabinet. The modern emphasis on executive government has considerably enhanced the lawmaking powers of the Cabinet and its individual ministers. The weight of government business undermines the backbencher's right to sponsor private members' bills, and few of such bills advance sufficiently to become law. The general rule that only the government may initiate spending and taxing proposals inevitably curtails backbench initiatives. Minority governments such as the Ontario Liberal governments (1985–87 and 2011–14) have not been uncommon occurrences since the 1980s, but one-party dominance of the provincial assemblies remains historically conspicuous. The Alberta Conservative Party (since 1971) and Nova Scotia Liberal party (1882–1925) enjoyed the longest periods of uninterrupted government office, followed closely by the Ontario Conservatives (1943–85). The provinces' first-past-the-post electoral systems also exaggerate government party majorities. A most extreme outcome of this occurred in 1987, when Frank McKenna's Liberals captured 100 per cent of the 58 seats in the New Brunswick legislature with only 60.4 per cent of the total vote. Electoral reform through the adoption of a proportional representation system became the subject of provincial referenda in Prince Edward (2005), Ontario (2007), and twice in British Columbia, (2005 and 2009) but all fell short of the required voter support. British Columbia remains the only province to have provisions for citizens' initiatives in lawmaking, and the recall of its elected representatives. National Assembly of QuébecThe website for the National Assembly of Québec. Government of OntarioThe official website of the Government of Ontario. A good resource for information about Ontario's history, economy, geography, and much more. New BrunswickThe official website of the Government of New Brunswick. Prince Edward IslandThe official website of the Government of Prince Edward Island.